‘Miracle Noodles’ name itself suggest/ depicts that it has some magic in it, it is not like other noodles. Now you must be wondering ‘WHY’ ? This is because of its ‘empty calorie’ function. Empty calories meaning calories derived from food containing no nutrients. Because of this nature/function of Miracle noodles, It can be used in our Ketogenic diet therapy. Ketogenic diet therapy is very rigid diet. The amount of food is specified by expert dietician but that dependents upon the nutritive values of each food product. So, when you have such product like Miracle noodles where you don’t have to count how much to eat, it make lots of difference to the patients who are on Ketogenic diet. So, when our patients complain about Hunger/ They want more food. We prescribe/ recommend them ‘Miracle noodles’. 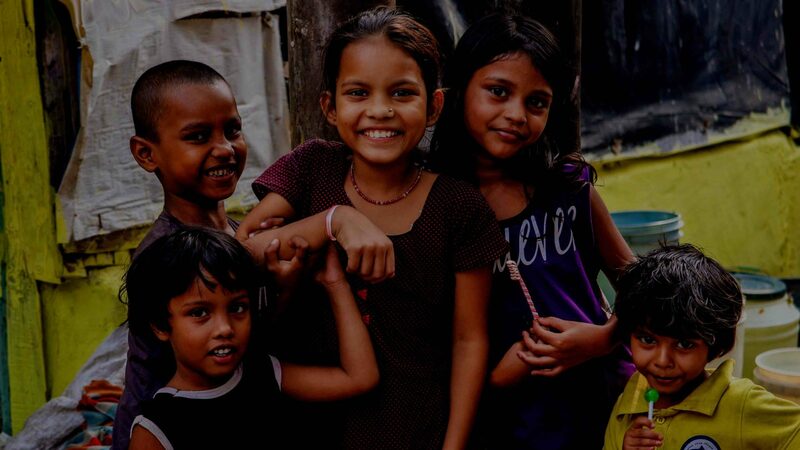 We see happy faces when we prescribe Miracle Noodle to our patients. Jonathan Carp, M.D. (President & Founder, Miracle Noodle) discovered them in Japan where it has been enjoyed over 1400 years. In 2006, He introduced the Miracle Noodles in USA. 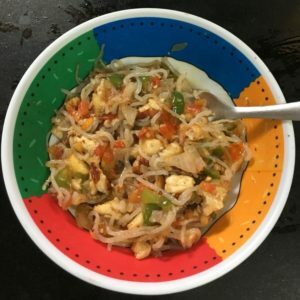 Miracle noodles also known as Shirataki Noodles are thin, translucent, gelatinous traditional Japanese noodles made from the konjac yam (devil’s tongue yam or elephant yam). 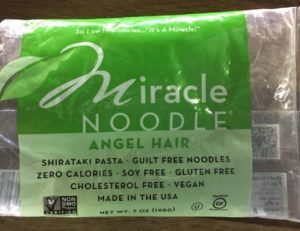 It is made from the Konjac flour which is obtained from Konjac plant and water, Miracle Noodle and Miracle Rice are 97% water and 3% soluble fiber – called glucomannan — (plus a natural calcium additive to help the noodles keep their shape). Glucomannan is a food additive used as an emulsifier and thickener. Konjac flour helps to improve digestive due to its prebiotic properties. management of high cholesterol levels. Hence it is truly a boon for patient who are on ketogenic diet. Note:-The amount of ingredients (except for Miracle noodles) is given by dietician. Take tomato, soaked red chillies, ginger and garlic together. Add them to the grinder/ blender. Cut bag of Miracle Noodles open with scissors and drain in strainer for one minute in cool water. Lightly boil noodles for 2-3 minutes. But no more than 3 minutes. After 1 minute, you should hear a squeaking noise.This means they are ready. Take oil in a pan and deep fry paneer cubes and keep it aside. In the remaining oil, add prepared chinese chutney/sauce. Sauté for few minutes. Add salt, turmeric, pepper powder and vinegar. Add deep fried paneer cubes in the gravy. Keep it on low flame for 3-4 minutes. Add Miracle noodles and mix it properly and garnish with finely chopped coriander leaves. “How To Cook”. Miracle Noodle. Arvill A et al. Effect of short-term ingestion of konjac glucomannan on serum cholesterol in healthy men. Am J Clin Nutr. 1995 Mar;61(3):585-9. Vuksan V et al. Konjac-mannan (glucomannan) improves glycemia and other associated risk factors for coronary heart disease in type 2 diabetes. A randomized controlled metabolic trial. Diabetes Care. 1999 Jun;22(6):913-9.